Hungarian rail operator MAV, has been using Comtest Wireless solutions to measure its GSM-R network since 2014. We have their kind permission to show this video, which demonstrates MAV’s capabilities to test overhead lines and the GSM-R network. From 0:00 – 10:20, Mr Akos Pilissy, the MAV measuring carriage “master” explains the structure and basic functions of the car. 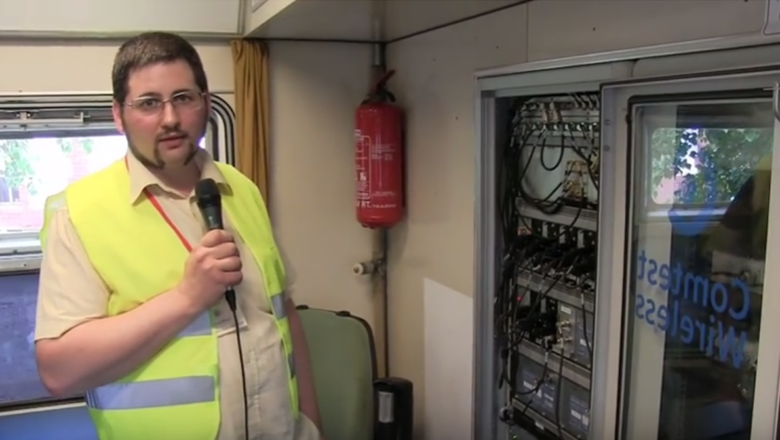 From 10:20 – 16:58, Mr Peter Kókai, a MAV development engineer, provides more detailed information about their GSM-R measurements (watch the video from this point on YouTube or fast forward the video above). Greetings to everyone. My name is Péter Kókai from MÁV’s technology unit. We installed the GSM-R drive test system in our overhead line measuring wagon in 2014, so that we could test the GSM-R network. Firstly, these black modules are MT2 cab radios (and we currently have 7 of these). Secondly, we have 3 scanners installed, which measure the GSM-R system’s operational band and the bands that are close to GSM-R, so we can see any interfering signals. Our measuring antenna set consists of 12 antennas, installed on top of the wagon. One of these supports the analogue RF system tests, 10 are used by the GSM-R test system and the final antenna is a GPS antenna. Acceptance measurements are done based on predefined scenarios and during optimisation, additional types of measurements are made by colleagues. Here’s an example of our 2 operator workstations. The screen shows that we’re currently executing an automated test measurement scenario. The system is testing data and voice quality, and related errors. During the optimisation process, an optimisation engineer works alongside the operator, at the opposite workstation. We provide him with access to data and he uses his own laptop to connect to the drive test system via the WiFi network. He can immediately find network problems and report these issues to the central troubleshooting team and Kapsch’s experts. He is also able to change settings on network. That’s what we do today. In the future, this system will be operated by MÁV’s experts. We will do continuous preventive maintenance and we will make adjustments, based on network parameter trends. Eventually the 935 km long lines will be tested 5-8 times in a year. However, during the optimisation process, it requires 10-15 times more line tests than we expect to conduct during the maintenance period.